Making your own pastry sheets (phyllo) is a process that needs love and patience. It may seem difficult at first but practice makes perfect and it’s really worth the effort. There are many types of Greek phyllo, multi and one-layered pastry sheets, suitable for savoury or sweet pies and pie rolls. I’d like to share with you everything I’ve learnt so far and I’ll start with the 1st version of the Greek phyllo family. This recipe produces four, extra large, multi-layered, thick pastry sheets, ideal for any savoury creation. The video includes detailed description and many tips. In a large bowl, mix all your liquids. Add the baking powder and some flour; keep mixing until the dough starts to thicken. Turn the dough out onto a well-floured surface. Gradually add the rest of the flour and knead for about 20min. till you have a soft and smooth dough (in a stand mixer or a kneading machine, it takes 5-8 min). Cut the dough into 4 equal pieces, cover with a clean towel and let them rest for 20 min. Flour your working bench; take one piece of dough, flatten it a bit with your hand and start rolling out. 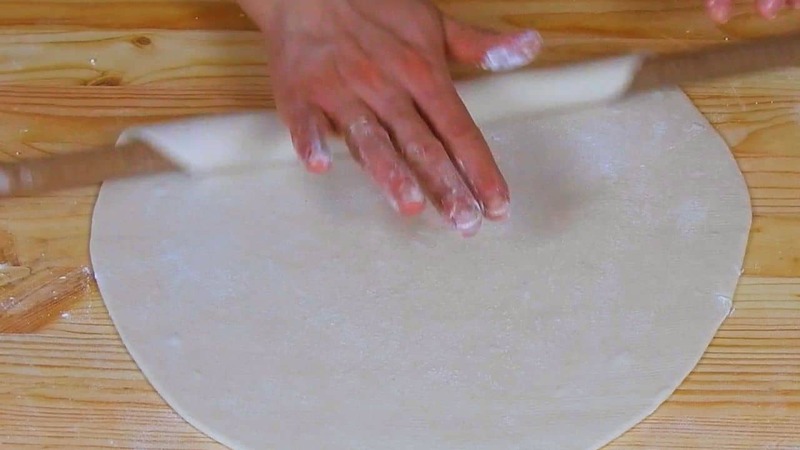 With a thin rolling pin, roll out the dough till you get a pastry sheet 40cm/16 inches in diameter. Brush the entire surface with melted margarine. Fold the two sides to the center. Brush with margarine. Fold in half and brush again. You now have a rectangle about 40x12cm/16×5 inches. Mark the center, and fold the two sides to the middle. Brush again. Fold in half and you’re done. You now have a pastry sheet with 16 layers that you can roll out any time you wish in order to make a Greek pie. Wrap the sheet with food membrane and place it the fridge. Repeat the same process for the other three pieces of dough. If you’re going to use them the same day, refrigerate for 2-3 hours to set. Otherwise, store them in the fridge maximum for a week or freeze them up to 3 months.